Spring is in the air, and that means...CHOCOLATE! 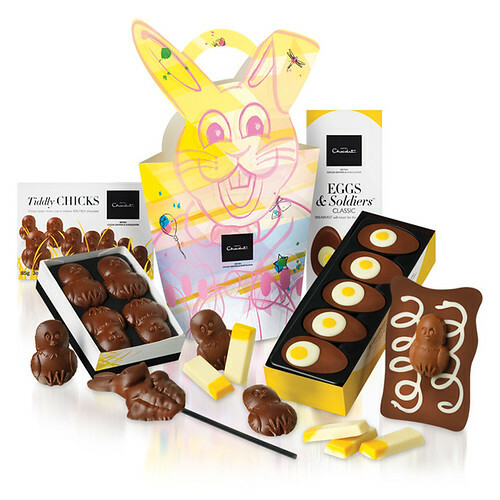 Yes, it’s nearly Easter, which means there is a great selection of chocolate Easter Eggs and other chocolate Easter gifts available to purchase. If you are planning an Egg Hunt, or just looking to get gift baskets for friends and family, you have only one more week to get geared up! The history of Easter Eggs dates back thousands of years, to a pagan holiday celebrating the Spring equinox. Culture after culture adopted the symbol of the egg as a "rebirth" to celebrate the Spring, and new beginnings, and it became widely associated with the Easter holiday. Many cultures decorate their eggs using a variety of techniques. Today, you can decorate your own eggs, or purchase beautifully-decorated chocolate eggs to give as a gift to celebrate the holiday. People decorate their eggs using paint, stickers, or a kit of egg dye. For those that would prefer a more simple method, edible chocolate eggs are available for purchase. One of the most popular Easter traditions involves the egg hunt. The night before Easter, the Easter Bunny visits homes and hides eggs, chocolates and treats. On Easter morning, children look for the eggs and other treats when they wake up, filling up their basket as they collect their prizes. Because of this, the Easter Basket has also become a tradition at this time of year. Some families set the egg hunt up so that there is an Easter Basket as the "prize" at the end of their hunt for each child, while others simply hunt for eggs and keep the Easter Basket visible for all to enjoy. Children and adults alike love receiving an Easter Basket full of goodies; it's a great gift and an easy way to make someone smile. Many families use chocolate eggs in their egg hunt, so that the treats can be eaten along the way. Chocolate eggs come in a huge variety of sizes and varieties. Some are small and foil wrapped, while some are as big as a child’s head. It's bound to make a most memorable Easter for any one receiving such a delight. Easter Gifts are not limited to chocolate Easter Eggs -- you can buy chocolate versions of the Easter Bunny in almost any shape or size. These can be wonderful additions to the Easter egg hunt or the Easter Basket. You can personalize a basket for anyone -- your children or your parents, your neighbor, a teacher or even a friend from the gym! By sharing a basket with friends or family, you're helping share a springtime smile. So this Easter, take some time to do something personally for someone you love - they will obviously feel happy, and you'll feel good about spreading that smile! I have been on a three-week sugar fast that ends a little less than a week before Easter. I'm afraid when I get hit with the Easter chocolate that I will be going a little crazy! This post is reminding me of what I'm missing right now! There is an Italian deli on my street that sells GIGANTIC chocolate eggs. I used to love to give them to my niece and nephew. Imagine the wide-eyed looks of a toddler getting an egg that's almost as tall as she is. I'm sure Ritika will be enjoying plenty of good chocolate next week! as its give a feel of personalized & unique gifts ideas.I liked it. Thank u.